On my first night in Australia, at a restaurant in Melbourne, I traded a bit of my barramundi fish for a bite of kangaroo meat. It tasted like highly seasoned steak. One taste was enough. Days later, after an afternoon at Cleland National Willdlife Park in Adelaide, I knew I’d never eat kangaroo again. They are even shyer than I am. But the ones in the park like being fed and being scratched under their chins, so they are polite and put up with humans constantly creeping up to them. They’re nocturnal, mostly. During the day they laze around under shade trees, in small groups (called mobs). Their eyes are often squinting, maybe because their sleep is always being disturbed. 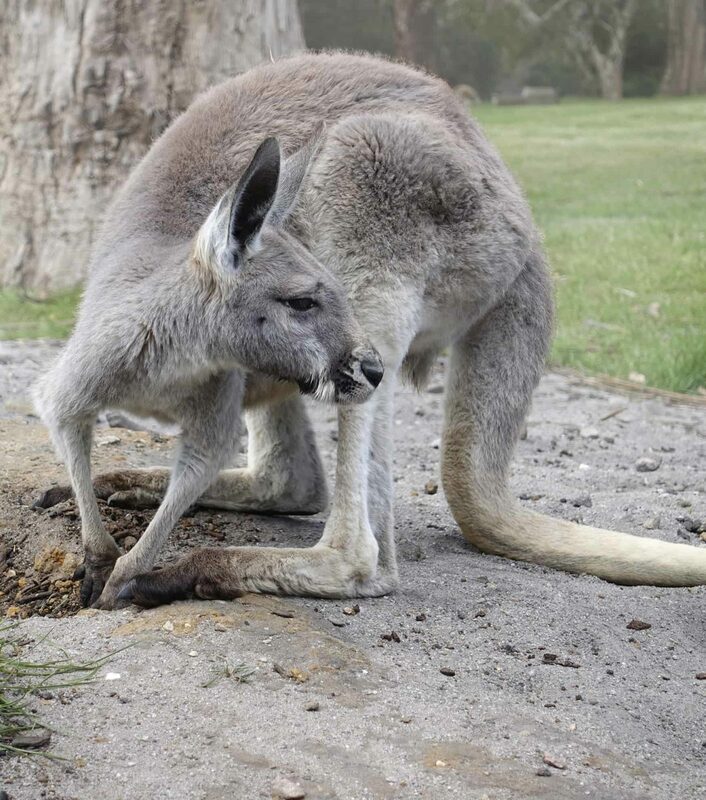 Kangaroo babies (called joeys) pee and poop in their mama’s pouch. When the pouch gets too smelly, the mother cleans it out. I saw this. It’s not pretty. In one single leap, kangaroos’ strong hind legs allow them to reach 3-feet-high and 25-feet-over. Supposedly a kangaroo can stand on its tail, but I only saw them using their tails as supports when standing, and as counterweights when hopping. Their paws, similar to human hands, have 5 toes; each is curved and clawed. They use them to grab, eat, dig, groom, and fight. Upon entering the park, I’d bought a small bag of kanga food. Hesitantly, I approached my first ‘roo with a trembling outstretched hand full of pellets, remembering that if you offer a horse an apple you have to stretch your palm flat so they can find the apple and leave your hand. Remembering how you end up counting to see if you still have all 5 fingers after you feed my dog Suki a treat. But here was this small sweet kangaroo. Or maybe it was a wallaby. I’d inconsiderately snapped several photographs as it lay in the field trying to sleep, so it really deserved some compensation. And as I got closer with the food, it looked at me with its half-closed eyes, got up, and slowly hopped over to me. It nuzzled through the pellets with its soft warm mouth. And then it laid both of its 5-toed paw-hands on my hand, and gently held on. Something in me melted. Something in me felt cared for, kissed. Something in me would later, and probably forevermore, prickle upon seeing kangaroo on a menu. Did you ever feel a deep connection to some strange creature you met up with in your travels? Was there ever an animal in your life that seemed to understand you? This entry was posted in 2017 and tagged animal lover, australia, bonding with animals, cleland park australia, eating kangaroo, human animal bond, kangaroo facts, kangaroo love, wallabies on 2017/11/27 by Robin Botie.